Over a pot of simmering water (double boiler) melt together chocolate, butter, and chili powder. Set aside once melted. Separate 4 eggs into yolks and whites. Be very careful not to get even one drop of yolk into the whites. Mix yolks with 2/3 cups sugar, bourbon, and water. Whisk yolk mixture over the double boiler until it's steaming and thickens. In a large bowl, fill the bottom with ice and water. Place a second bowl inside the ice bowl. Add yolk mixture to the interior cold bowl and whisk yolk mixture until it's cold and thick. Then whisk in chocolate and butter mixture. Remove from ice bath and set aside once the mixture is cool. Add egg whites to a metal (preferably chilled) bowl and whip with a hand mixer or stand mixer until the whites turn frothy. Add pinch of salt and sugar and continue to whip until the whites form very stiff peaks, about 4 minutes. Add vanilla. Take 1/3 of the egg whites and stir it into the chocolate mixture to lighten it up some. Take the rest of the egg whites and carefully fold them into the chocolate. Don't stir. Fold gently. The goal is to integrate them while keeping as much volume to the egg whites as possible so the mixture becomes very light. Chill the mixture for a few hours. Serve the mousse with a pinch of extra chili powder or if you want it hotter a pinch of cayenne pepper. The first time I had the flavor combination of chocolate and chili was in the traditional Mexican sauce called mole. I was blown away by the complexity of the flavors. Ever since then, I’ve been playing around with chocolate and chili powder. 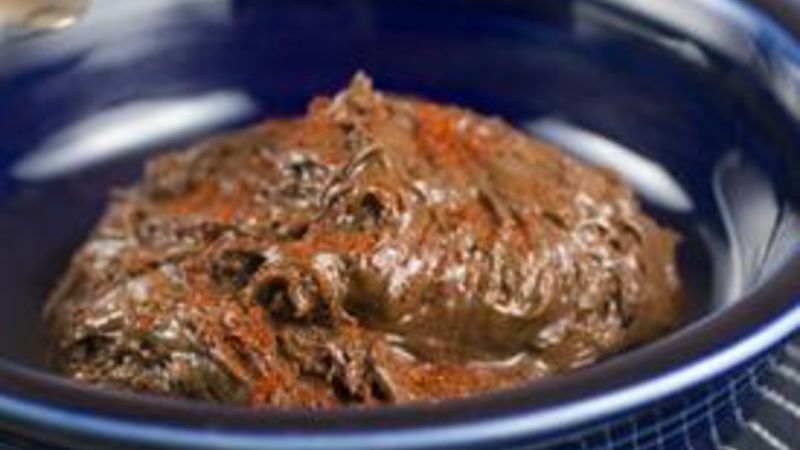 Traditionally, you can add a small amount of chocolate to a chili sauce to smooth it out. For this recipe, I turned that idea on its head and added a tiny amount of chili powder to a lot of chocolate! The result is my sweet heat mousse and it’s really one of my favorite desserts. Even if you don’t like the chili powder addition, this chocolate mousse on its own is one of the most decadent desserts around. While this mousse may look complicated, don’t let it freak you out. Break it down into its parts and it’s very manageable. The first stage of the mousse is to make the chocolate base. This is where a lot of the flavor comes from. This is also where you add in your chili powder. Chili powder actually doesn’t add a huge amount of heat to the dish, but it mainly adds a savory flavor to it. If you really want to add some true heat, add a small pinch of cayenne pepper! It’s never a good idea to warm chocolate over direct heat because it can very easily scorch. I recommend setting up a quick double boiler for the work. Basically just bring some water to a simmer and then set a large bowl over the simmering water. Add your chocolate, butter, and chili powder to the bowl and stir it regularly as it melts. Once your chocolate mixture is melted and smooth, take it off the heat. Now you need to separate some eggs! This might seem like an odd way to do this, but it’s very important to do them one at a time. If you get even a drop of yolk into the whites, then they won’t whip up correctly later in the recipe. So do one egg at a time and then add those whites to the larger bowl. Working with the yolks first, mix them with 2/3 cup of sugar, the bourbon, and the water. The bourbon isn’t essential, but if you leave it out, sub water for it so the liquid ratios stay the same. Add this bowl over the same double boiler set up and start whisking the yolks. As the yolks heat, they will start to froth and steam and then start to thicken. When they start to get thick, they are done. It will only take a few minutes. Now the goal is to cool off the mixture as soon as possible, so add the bowl to a larger bowl filled with ice water. Whisk this as it cools and it will thicken even more! Now just mix the chocolate mixture in with the yolk mixture. This will be very thick, but just continue to cool it over the ice until it’s at least room temperature or a bit cooler. Now let’s talk egg whites. This is the real trick to a good mousse. Right now we have a very thick chocolate custard mixture and we want to gently incorporate light, airy egg whites to make the rich custard very light. You can whip egg whites by hand, but it’s a workout. I’ve done it before and it takes ten minutes of very solid whisking. However, if you have a stand mixer or hand mixer you can bring them together pretty quickly. When the egg whites start to get frothy, add the tablespoon of sugar and a pinch of salt. Once they start to form peaks, add the vanilla. Once the egg whites are the right stiffness, take about a third of the whites and just stir it in with the chocolate custard mixture. This will lighten up the custard so it’s easier to work with. Now for the gentle part. Take the rest of your egg whites and just gently start folding them into the custard. Use a plastic spatula and run the spatula around the bottom of the mixture, gently incorporating the whites and the custard. After a few folds, the two mixtures should be pretty evenly incorporated. They don’t have to be perfect. It’s okay if there are some white streaks. Better that than to over-mix it and lose the lightness of the mousse. Let this chill for a few hours and then serve it up! I like to serve it with an extra sprinkle of chili powder and a very tiny pinch of cayenne! Nick dipped strawberries in this mousse and it was super-delicious. You might want to consider that for Valentine’s Day! Check out his blog, Macheesmo, and follow him from his Tablespoon Profile.